This is a hand painted lanternslide in handmade wood frame. This slide is part of a collection made by Samuel Reader between 1866 and 1913. Reader was a Kansas farmer who was active in the early Topeka community. He built two of his own homes, served in the Civil War, and wrote in a diary nearly every day for 64 years. 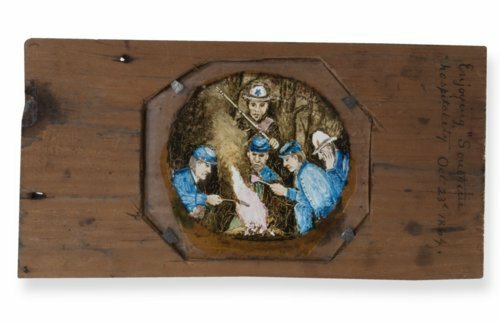 This slide depicts four Union soldiers surrounding a campfire and being guarded by a Confederate soldier. Reader and other soldiers in the 2nd Kansas Militia were captured by Confederates at the Battle of the Big Blue on October 22, 1864. The slide's reference to "Southern hospitality" is ironic given that the captured Union soldiers received little food or water. On October 23 they mixed flour with water, placed the dough on a forked stick, and cooked it over a campfire. Reader escaped a few days later by disguising himself as a Confederate soldier and pretending to be in search of a lost horse.